Within 10 minutes of a “Dr. Oz” episode, the phone at Staple & Spice Market in Rapid City often starts ringing. “It is crazy,” said manager Kayla Raterman. “He’s bringing great business our way.” Those phone calls are part of the so-called Oz effect: the reaction people have to the popular CBS medical program, “The Dr. Oz Show.” If Oz recommends it, people tend to buy it. Forbes magazine reported that after the Neti Pot was discussed on “Dr. Oz,” sales of the sinus irrigation system increased by 12,000 percent. Internet searches for Neti Pots exploded by 42,000 percent. Dr. Mehmet Oz, the host and star of the show, is a cardiac surgeon with a Harvard University education and a long list of credentials, including professor of the department of surgery at Columbia University in New York City and director of the Cardiovascular Institute and Complementary Medicine Program at New York-Presbyterian Hospital. Oz began appearing on “The Oprah Winfrey Show” in 2004, touting his desire to reach more than his individual patients with heart health advice. He wanted to reach the masses. His popular health advice on “Oprah” gained a faithful audience, and in late 2009, he launched his own show. Since then, the nationally syndicated series has been a boon to health food stores across the country — including those in Rapid City. “We’re always happy to see ‘Dr. Oz’ come on,” she said with a smile. 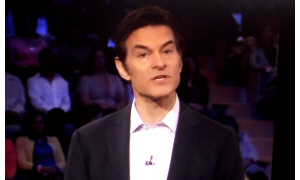 Both Hollenbeck and Raterman say the majority of the customers responding to Dr. Oz are interested in his weight-loss recommendations. When Oz’s show touted the benefits of a product called SafSlim, safflower oil used to reduce belly fat, the product flew off the shelves. When Dr. Oz suggested raspberry ketones, a supplement derived from raspberries used to increase weight loss, Staple & Spice not only ran out, but had a waiting list of 350 people. “We stopped taking names and numbers after a while,” Raterman said. Main Street Market also had a waiting list for ketones as well as other Dr. Oz recommendations. For instance, when he talked about saffron extract for appetite suppressant, the waiting list of customers was more than 60, Hollenbeck said. “We couldn’t find it anyplace,” she said. In her years in the business, Hollenbeck said she’s never seen a singular force carry such an influence over the market, but she’s glad Oz does. His recommendations have also brought Main Street Market, which moved recently to Tuscany Square on Omaha Street, a lot of new customers. “He’s driven them into the store, which is great,” she said. Raterman said she would love to know ahead of time what products Oz might recommend, but she’s not complaining about his influence. “It works for us,” she said.